(JON) I woke up at about 7 a.m. The boys were still asleep. It was time for a nice hot shower. Ahhh. When I got back to the tent, the boys began to wake up. They got up and off we went to the town of Innsbruck, Austria. We had to find a Renault dealer to get our 7500 km. check-up and to get the window and locks fixed from the break-in. We found the place and made an appointment for tomorrow at 1 p.m. Next we went to Hall, a city just outside of Innswood, I mean Innsbruck. The clouds were still lingering so we couldn't see the grandeur of the Alps. We had forgotten about our half-way treat--McDonald's. Yes, we had McDonald's for lunch. We finally found the town of Ghew*%#@$%*EE@@*% that we were looking for. Unfortunately, the hotel and cafe were closed. So the next best thing was a hike. Off We went. The rock-crushers are still in their prime. 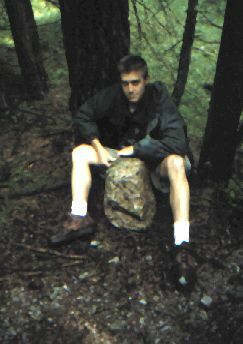 Matt found a huge rock and rolled it down the hill. On it went, right through anything it came in contact with and clear out of sight. All we could hear was the echo of the rock hitting things on its way down for about 10 minutes. We went to another trail. It was prettier than the first one. 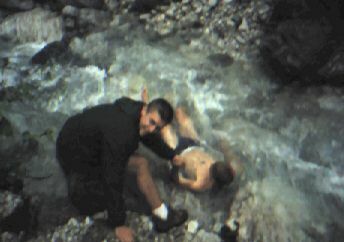 There was a freezing cold stream there. I know it was cold only because I went into it. Yes, the common words of Matt, as we all know, flowed from his mouth, "Jon, How Much to go into the stream up to your neck?" I thought about it and said five bucks. The agreement was settled. I had to get into the water and stay there for 15 seconds with water up to my neck. On I went down to the stream in my skivvies. The countdown began. While I was hyperventilating, I could hear 1 ... 2-..3... blah, blah, blah, blah... 15. Yeah! 1 just made the easiest $5 I ever done. Not to my knowledge, right after I shed my clothes, I glanced up the hill and saw that two women were watching too. They couldn't see anything; they were too far away. There was nothing to see anymore... the water was too cold. After all the excitement, we found a supermarche and went back to the same campsite we were at the night before. We just ate dinner. I wrote a letter to Sherri. Chris is playing the harmonica. I don't know what Sam is doing and Matt is drying his sleeping bag. Good night. And, of course, it's raining!